At last, we are hosting the beginning of what we hope will become a regular event. A chilled space for those who are interested in explorsing spirituality but do not consider themselves to be Christian - to explore issues and questions pertaining to Christian spirituality. For the first of these events, we are keen to meet up to explore what themes and issues people would like to explore, from artistic, philosophical or theological perspectives. Plans are for discussions, where someone may go and prepare and explore an issue for the group to discuss – which may be a poem, a piece of art, and idea, or questions about specific issues pertaining to spirituality. Please do let Ian know if you or your friends are interested in attending by emailing [email protected] Please do forward to this who ever you would like. A few things that it is not. An Alpha Course, a Conversion Course, Christianity dressed up trendily, Brain washing or a cult. Please contact us if you have any queries, see below for a map and website info. 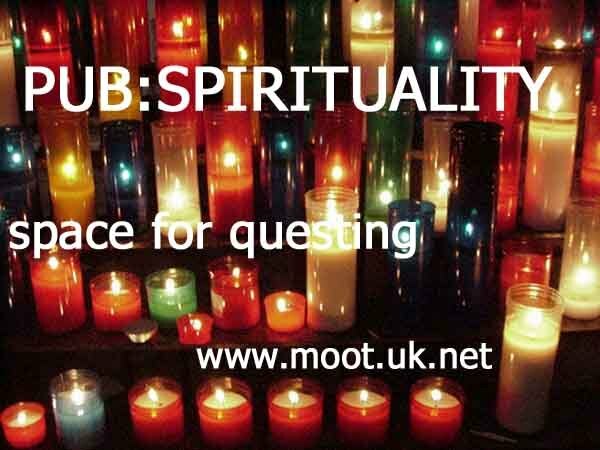 Moot is one of the the spiritual communities that make up Dekhomai – that promotes alternative exploration of Christian Spiriuality at ‘Mind Body and Spirit’ festivals in the UK. "Every new idea is born drowning" said Bob Woodruff. Have you ever been in a group setting when some creativity was called for and everyone was too scared to suggest an idea in case someone else squashed it? Most groups that have existed for a long time don't do ideas very well or leave them to a select few for this very reason. No sooner has a 'baby' idea hit the table then it is drowned by premature practicality, "that'll never work", "that's impossible". If you are facilitating an 'ideas' session put some strict rules in place first. 1) Every idea must be followed by a positive comment. If anyone says anything negative they have to take a forfeit: stand in the corner, wear a silly hat or something. 2) There are no good or bad ideas – reserve judgement for later. 3) Some ideas are just seedlings and need building. You don't know which is which yet so suggest all your ideas, half-developed or fully formed. Remember that crap fertilises! 4) If you can 'build' on someone else's baby idea give credit and say "My build on Sam's idea is . . ."
5) Headlines only. All you want in a dynamic, fast paced ideas session is the headline. Quantity of ideas rather than detail and development.